I named him Cody, because when I bought him in 1990, that's what the folks at the now defunct Bloor Cycle called the model. It was $400, which seemed like an awful lot of dough to this teenager. My buddy Ed and I were into skateboarding, and periodically I'd throw a skateboard or surf sticker on the frame. From 1990 through 1999 I rode that bike like crazy. It got me to and from work, to and from high school and university, all over the city. I lived on my bike until I moved out of a basement apartment on Clendenan and into a high rise. That's when Cody went into storage. Life got in the way, and I never did get back into biking that summer. I've since retired Cody and am now the proud owner of a new Giant Escape 2. Here's the old and the new, passing the torch. So far, so good. I've been out four of the past five days and I'm feeling the love again. But I can't throw out Cody... I think I'll restore her out of love. I bought myself a bike at Bloor Cycle too, back in the 80s. There used to be lots of bicycle shops at that section of Bloor Street. Then Crack moved in. It is a lot better - if rundown - now though. Followed by the low-usage Albion Road - Hwy 27 route and the Highway 401 meets 404 area's East Don Parkland (IMO). Of note: 25% of High Park's dirt trail portions have been gated and fenced for unleashed dog walks toward their pre-existing park section near the consignment gardens and Theatre stage. Expect dog fights since lesser dogs can no longer back away from an Alpha Challenge, and crap build-up since none can step aside from the trail itself. For years I have jogged thru those same trails (within a varied circular route) without any troubles whatsoever. P.S. My second bike (from the 90s) stills uses parts and replacement parts of that earlier bicycle. I do most of my biking along the Humber River and the paths to James Gardens. And I'm stripping my old accessories from my old bike and moving them to my new ones. Better pedals, toe clips, rack, etc. @CQ - did you know Mike received this new bike free from Giant? For the record, Giant didn't give me anything. This bike was bought with actual money. I'm glad Elvis didn't bust me for abusing taxation monies by taking a free map. I had purchased $4 bicycle maps from MapArt during the recent past. This newer, slightly smaller, city gov't version is made of slick, less tearable, paper. Although I figure - heck the Assistant Librarians earn $33 to $38 an hour (advertised union position, excl., medical and public pension costs, 2010). I can take a lousy $4 retail priced "free" map. 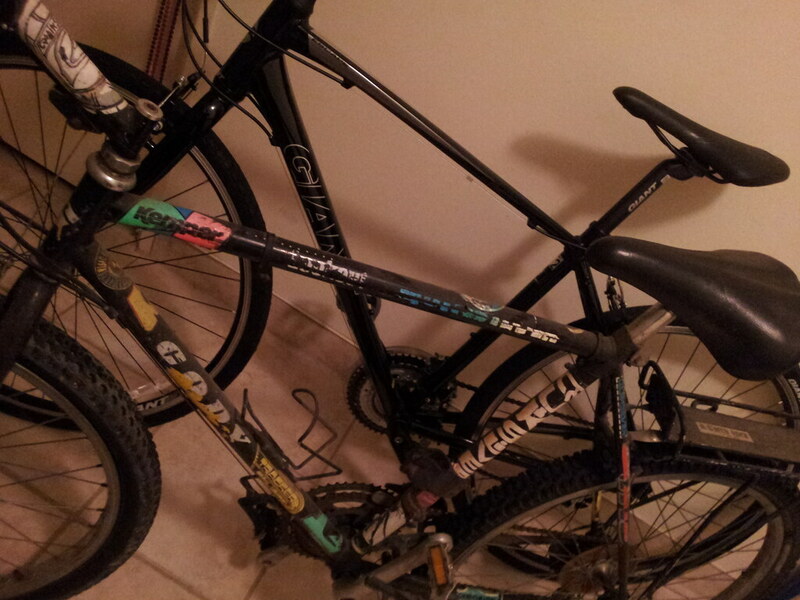 Just tossed my sons old Raleigh Mountain bike that he was going to restore over the last 2 summers. He finally bought a new Specialized road bike, so I then took the liberty to toss the old one. You say you're transferring all the accessories-- but where's the Slimer horn? Huh?